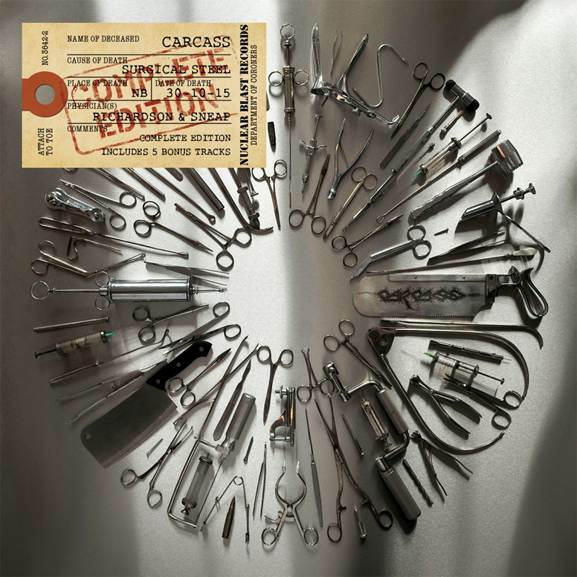 British extreme metal icons CARCASS have just announced the release of a special edition version of their latest album ‘Surgical Steel’. The ‘Complete Edition’ includes the whole album ‘Surgical Steel’, which comes packaged with the entire ‘Surgical Remission / Surplus Steel’ EP. The ‘Complete Edition’ will be available on CD and digitally on October 30th & on vinyl November 20th via Nuclear Blast. You can pre-order the ‘Surgical Steel – Complete Edition’ – Limited Edition Double Gatefold Silver Vinyl HERE. All the songs were recorded during the ‘Surgical Steel’ sessions, which was produced by Colin Richardson (Napalm Death, Bolt Thrower, Gorefest, Cannibal Corpse, Sinister, Rodrigo Y Gabriela) and mixed/mastered by Andy Sneap (Megadeth, Accept, Exodus, Testament). You can see CARCASS live in the UK this October when they headline the highly anticipated ‘Deathcrusher Tour 2015’ alongside Napalm Death, Obituary, Voivod and Herod. CARCASS have released several classic albums over the years, including the Decibel Magazine US ‘Hall of Fame’ inductees ‘Heartwork’ and ‘Necroticism’ – ‘Descanting the Insalubrious’. Their influence has changed the face of extreme metal with every consecutive release. Whether it was inventing gore-grind (i.e. ‘Reek of Putrefaction’, ‘Symphonies of Sickness’) or creating the template for melodic death metal (i.e. ‘Heartwork’), CARCASS has always made records by which bars were set and rules were broken. Upon the band’s dismantling in 1996, fans mourned the loss of the seminal act and longed that the group would return again one day. In 2007, the metal world got its’ wish as CARCASS reformed to play several sold-out reunion shows around the globe. Once again re-motivated to administer a shot of cynicism and infectious riffs into the arm of a sickly metal scene, founding members Bill Steer and Jeff Walker began writing what would become the latest output of their highly influential career, ‘Surgical Steel’. Only the choicest of cuts were made, and blood sweat and tears were shed to bring us a record worthy of the CARCASS legacy. In short, ‘Surgical Steel’ was just what the doctor ordered.